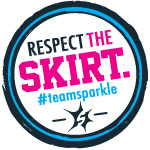 NOTE: This post was also posted on one of my favorite cupcake blogs, Cupcakes Take the Cake! Last night we made our annual trip to the OC Fair. Pretty much the only reason we go is to pig-out on greasy, fried food. Since I only do it once a year, it doesn't feel quite so glutenous. The OC Fair has an expanding range of fried food. Every year there is something new to try. Two years ago it was the fried chicken sandwich with two Krispy Kreme doughnuts instead of a bun, topped with cheese and honey. Talk about heart attack! So what could be better than an array of fried food at the fair? Why, a cupcake, of course! I was so excited when I saw this booth selling cupcakes. My mind was set, I was going to eat a cupcake! So what could top wonderful fried food and a cupcake at the fair? A fried cupcake! I needed to try one! I found the fried cupcakes at the Spud Shack. The Spud Shack also sells other fried foods, such as curly fries, tator tots, and Chocolate on-a-stick (I was slightly disappointed to find out that the "chocolate" on-a-stick was just a Tootsie Roll). I wondered, what is a fried cupcake? Is it frosted and fried, as is? I was very intrigued! After about five minutes of waiting patiently (fried cupcakes are apparently very popular), I had mine. I ordered the chocolate fried cupcake. From what my taste buds could gather, the cake part of the cupcake was baked and then deep-fried. After pulled out, they put a chocolate sauce on top and finished with sprinkles. I was actually very apprehensive about trying this cupcake. I wasn't expecting to like it because it was fried. I haven't eaten many sweet foods that have been given the fried treatment, so I didn't expect it to taste very good. My first bite told a different story. It wasn't too bad. From then on, every bite was better and better. I really enjoyed it and ate the whole thing by myself. The only thing I was bummed out on was the frosting. The thin layer of chocolate sauce wasn't enough. I wanted some real frosting, piled high on top. In hindsight, I realize that frosting would have melted because the cupcake was served hot. Verdict: Try something new! My fried cupcake was a sweet surprise and something I will look forward to eating again next year! 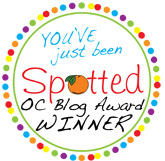 This morning I was mentioned in the Fast Food Maven's blog! The Fast Food Maven writes a blog about fast food news, along with sweets (namely cupcakes), in the fast food industry. I referenced her Cupcake Challenge a few months back. Check out her blog! Saturday was a pretty big day for me! I raced in my first olympic-distance triathlon. My husband promised me that if I finished in less than three hours, he would take me to Elizabethan Desserts in Encinitas. My goal for the race was three hours and five minutes, so that would mean finishing five minutes faster than I thought I could. I guess the motivation worked! My final time was 2 hours, 48 minutes, 50 seconds. I love the atmosphere of this place. It is so homey. The last thing I want is corporate produced cupcakes. These desserts seem to have time and love put into them. My husband got permission to take a few pictures of the bakery from Elizabeth herself. Both times we have been there, she has been behind the counter making cupcakes. The love the fact that she is so hands-on with her products. Last time I tried the Monkey Business cupcake (banana cake, white chocolate frosting, caramel drizzled on top) and it was definitely the best cupcake I have ever tasted. I knew I couldn't go wrong with something so wonderful, so I got that cupcake again. I also bought a few of the Chocolate Peanut Butter ones and a Coconut to share with my family. In hindsight, I wish I had bought some other flavors. I guess that means I need to go back soon. The verdict? Just as tasty as before! My husband was talking to Elizabeth who said that the Monkey Business cake was a little bit denser than usual. I had noticed that also. She explained the difficulties of baking with fruit and finding the right consistency for denseness and moistness. Elizabeth was debating on whether to pull the cupcakes because they weren't as delicious as possible. Even though I enjoyed the cupcake as much as the first time, I also appreciated Elizabeth's attention to detail and care for the product. This kind of attitude may have helped her business to become as successful as it is. I had an epiphany on the drive home. These cupcakes are definitely different than any other cupcake that I have tried before. I think the difference is that these cupcakes are more like desserts in a cupcake shape. The cake in Monkey Business is not the same as the usual consistency of a "normal" cupcake. Having thought this, it does not change my opinion at all. Elizabeth Desserts has just differentiated themselves by going beyond the traditional cupcake idea. 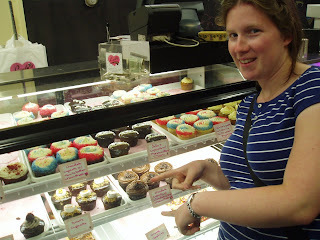 I love their cupcakes and need to go back soon to expand the number of flavors tested. Thank you! Recently a friend was saddened when I attended an event and didn't bring any cupcakes. I am now known as the cupcake girl! I was very excited to be given this unofficial title. So last week my husband had a birthday. We had a party for him and, of course, I had to bake cupcakes! I wanted to try something a little different. 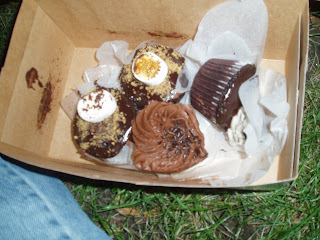 One of my favorite cupcakes that I reviewed recently was the Peanut Butter from SusieCakes. Peanut butter and chocolate are just made to go together! So peanut butter and chocolate were my inspiration for my birthday cupcakes. I used a devil's food chocolate cake mix. For the frosting I used milk chocolate, and then mixed about 3 Tablespoons of peanut butter. Last, I sprinkled large chunks of Reese's Peanut Butter Cups on top. They were a success! I think that the crumbled Reese's were definitely the key to my cupcake success. I had to control myself by only eating one because I have my triathlon on Saturday. (I try to cut out sugar for the two weeks before my races.) But watch out after my race! 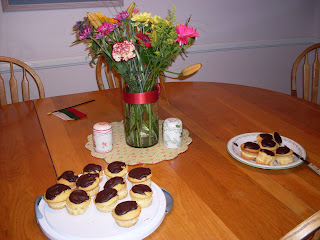 My sister recently sent me a recipe for some cupcakes called Boston Cream Pie Minis. They sounded delicious, but I haven't found the time to bake them yet! This week I had the privilege of trying them as she made them to celebrate my brother returning home. She cut the yellow cake cupcakes in half horizontally and put filling between the two halves. The filling was made out of Jello Vanilla Instant Pudding. The topping was a mixture of Cool Whip and semi-sweet baker's chocolate. Of course I am always nervous when Cool Whip is involved (bleh! ), but they were exactly how I thought they would taste...delicious! (I didn't even remember that there was Cool Whip involved until I read the recipe today, so it wasn't even an issue.) They were light so I didn't feel bad for eating one three days before my next triathlon. Thanks, Robin! My brothers were heavy in the Pokemon phenomenon back in the day. I, on the other hand, can only recognize a handful of the characters. But when I saw this cupcake, I knew exactly who it was. Reader Ms. Chocolat sent me this adorable picture of a Jigglypuff cupcake. She created these cupcakes for a friend's daughter's birthday party. She used vanilla cake, buttercream frosting, and fondant for the face. I have yet to taste a cupcake with fondant. This is the cutest cupcake I have ever seen though! 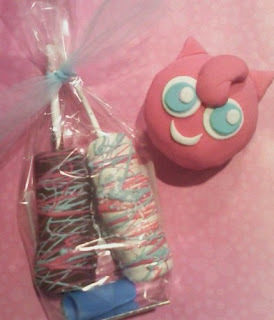 She also made "mellows on-a-stick." Not sure exactly what they are, but they sure do look yummy! I keep hearing about all of the wonderful cupcake stores on the east coast. I dream of traveling there to visit as many stores as I want. 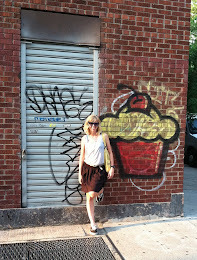 It is a fantasy, but for now I will focus on finding the good cupcake bakeries here! 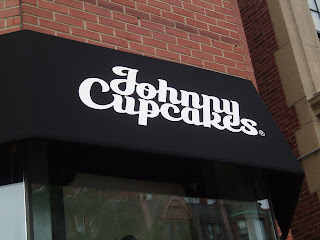 Matt and I were in Boston for the 4th of July visiting Kristin my old roomie and we were walking down Newbury Street and I saw a sign Johnny Cupcakes and I don't think I have to mention how excited we got. However when we went into the store we didn't find cupcakes, it was a store that had shirts etc. but to tease us they were displayed in glass cases like you would find in a bakery. Well, needless to say we were a little disappointed, and all we had on our mind was cupcakes. We headed to the North End, which is famous for it's sweets so we figured it was our best hope...even if we didn't find cupcakes we would be able to get something yummy. 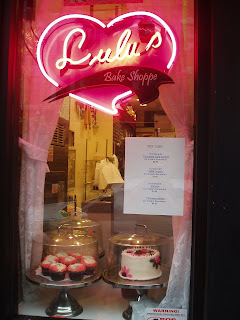 We found Lulu's Bake Shoppe! There was a decent selection of cupcakes, but we went for S'more, Oreo, and chocolate, all with buttercream frosting. They were all delicious, and the cake part wasn't dry, the frosting was a little sweet, but still very yummy. These cupcakes look yummy! If I am ever in Boston, I know where to go. Thanks, Laura!